What is wrong in saying , Rahul Gandhi is half-Indian? Actress Katrina Kaif has apologised for her comments describing Rahul Gandhi as “half Indian” but said her remarks were taken out of context. “The comments have been misconstrued. They have been taken out of context. But having said that if I have caused hurt to anyone’s sentiments, I deeply apologise. It was not the intention at all,” Kaif told a TV news channel. The actress, who turned 28 recently, said she made those comments without any “malice or real thought” but regretted they were misconstrued by the media. “I will also request the media not to make a controversial issue out of something which was not meant with any intention or malice or any real thought behind it. That’s all I have to say,” the actress said. Kaif’s role in Prakash Jha’s ‘Rajneeti‘ also courted controversy as it had some similarities of accent with that of Congress President Sonia Gandhi. Katrina should have stuck to her guns There was no need to apologize for a factual statement. Look at how touchy Sonia Gandhi’s boot lickers are when it comes to foreign origins of Rahul Gandhi? They are mortally afraid that if public starts thinking about roots of Rahul, shh….., they won’t let him be the Prime Minister of Bharat. Is it not funny that This bafoon, Manish Tiwari talks abbot lowering of political discourse. Dear, no one can lower it any further than Sonia’s puppy dog, Digvijay Singh. I am truly disappointed in the financial reward. It is a cruel joke. It would have been better not to offer a reward. I can see that amount for an informant but here is a lady who got hold of live bombs and took timely action to save many lives at the risk of her marriage and facing possible ostracizing from her community. I urge Narendrabhai Modi to rectify this mistake and announce suitable reward. This is Narendra Modi’s Gujarat where a Muslim woman comes forward to expose her own husband’s nefarious, anti-national activity and they (anti-Modi brigade) say that Muslims live in fear in Gujarat! The government of Gujarat has taken a decision to honor a brave Muslim lady Reshma of Ahmedabad who yesterday informed the police about her husband’s activity of making crude bombs and his plan to do bomb blasts in the city. 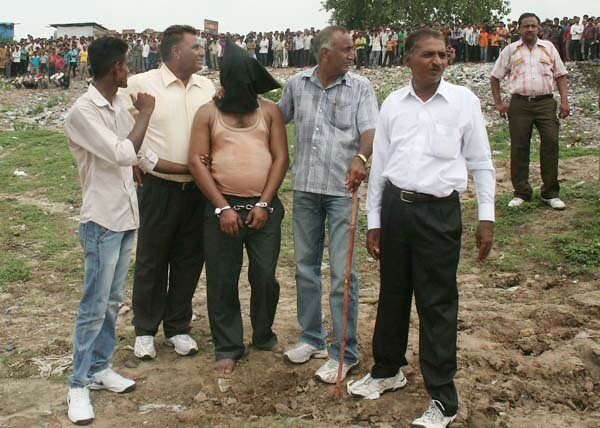 Reshma’s husband Shehzad was later arrested by police with 8 crude bombs and two desi tamanchas. Reshma living near Chandola lake of Ahmedabad’s Muslim dominated Danilimda area had helped the police earlier also. Few years back, with Reshma’s help, police had nabbed Bangladeshi intruders living illegally in this area. 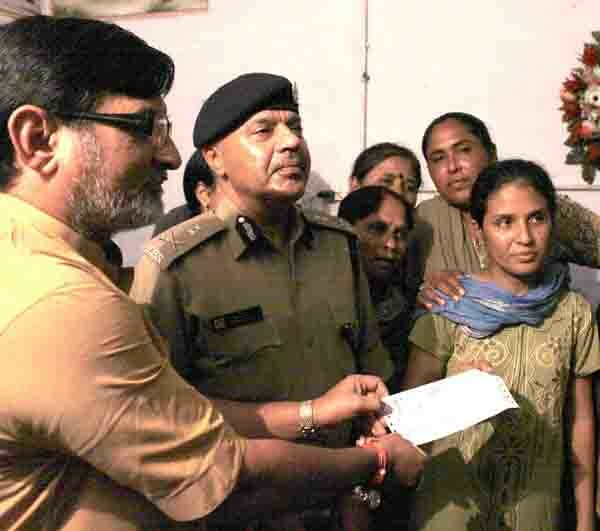 After her husband’s arrest, Reshma had said that she wanted to save lives of many people by informing the police about her husband’s activities. 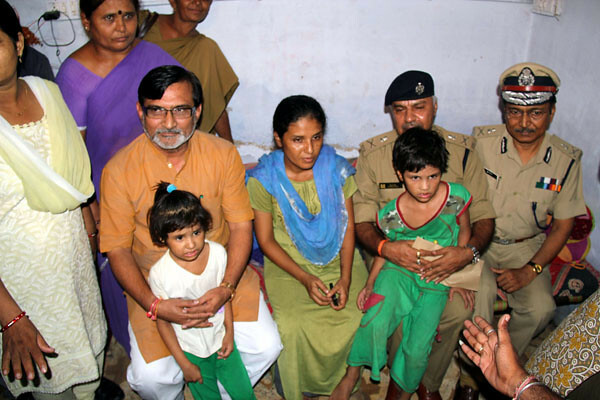 Reshma was today visited at her residence by Gujarat Minister of state for Home Shri Praful Patel, Ahmedabad Police Commissioner Shri Sudhir Sinha, Gujarat Police Chief DGP Chitranjan Singh. 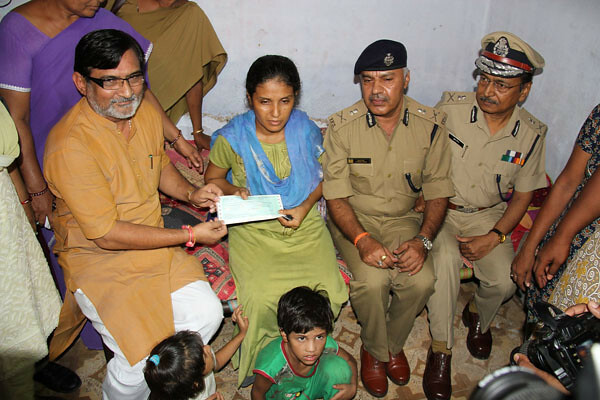 Shri Patel, Sinha and Singh appreciated and congratulated her for her brave act of public good.Minister Praful Patel presented Reshma a cheque of Rs. 25,000 as a bravery award. Mr. Patel profusely praised Ms. Reshmaben’s courage despite being a woman, rising above her concern for a close relationship, its repercussion and likely reaction in her close society. He described the act as a great personal sacrifice in the larger interest of the national security. Chief Minister Narendra Modi described the Ms. Reshmaben’s sacrifice as an exemplary act for the security of six crore Gujaratis, displaying a rare example of communal amity. Mr. Singh in a word of praise for Ms Reshmaben for setting a rare example of paying more importance to the motherland and nation’s interest rather that her own family. He said that such information or tips lead to solving several criminal cases. Mr. Sinha offered Ms. Reshmaben a job in the Traffic Brigade and assured to provide her all possible security if required. Talking to newspersons present on the occasion, Ms. Reshmaben, who studied up to Standard XII in Mumbai, said that she would always side with the law of the land and fearlessly expose criminal activities, even if they were her close relatives, and asked all womenfolk to do the same. Meanwhile Shehzad was sent to ten days remand by the court today in Ahmedabad. In another development, the Gujarat Police has taken a decision to hand over the Shehzad case to Anti Terrorist Squad. This decision was taken in view of Shehzad’s confession that he wanted to throw bombs indiscriminately during Ahmedabad’s annual Rath Yatra. Seven ATM cards and sim cards are recovered from Shehzad’s possession. Protest Starlight Pavilion for showing Nina’s movie ! Starlight Pavilion, New York, USA is going to exhibit ‘Sita Sings the Blues’ movie on 21st July 2011. The movie ridicules Goddess Sita and Ramayana in very bad manner. The movie is created by Nina Paley, American Cartoonist, who states that this story is based on the Ramayan of Rushi Valmiki; but what she has done is take the ingredients of the epic story and give it a meaning which is completely opposite to the spiritual truths that the scripture conveys. It is duty of all Hindus to protest lawfully against ‘Starlight Pavilion’ so that it should not exhibit ‘Sita Sings the Blues’. Click Here : Participate in online signature campaign and voice your protest ! Our fellow Hindu Brothers and Sisters, lodge your protest ! The way to extinguish a religion is to first create utter disrespect for it in the minds of people about their faith. Then ridicule the followers so that they are downright ashamed of being Hindu. Then the lost directionless Hindu populace will be soft targets to defeat on any front. Are you going to blindly allow this unrighteous strategy to work ? Or are you willing to stand up for Dharma and realise that in this increasingly unrighteous world, ‘Only Dharma protects the Dharmic’. Ultimately Dharma will be established in the world and evildoers will be destroyed. But each Hindu is now being called upon to play his/her part and do something to stop this outright denigration. Become a vanar of Lord Hanumans army ! Make your small offering towards Dharma by lodging your protest. Nina Paley, an American Cartoonist, is the creator of the animated film ‘Sita Sings the Blues’ which is available for free viewing on the internet. A devout person cannot begin to imagine what Nina Paley has conjured up and graphically crystallised in this film wherein Lord Ram often kicks Sita…. and walks on her pregnant stomach…. These are only two of the many painful images one must endure. The only reason for watching this absurd film is to make people aware of what a completely false representation this film is of the Ramayan and how it nosedives into taking the issue of denigration to an unbelievably low level. She states that this story is based on the Ramayan of Rushi Valmiki. But what she has done is take the ingredients of the epic story and give it a meaning which is completely opposite to the spiritual truths that the scripture conveys. Unfortunately, this film is being recommended on various parenting websites, for children to watch. Those who are unfamiliar with this Holy Scripture are going to accept this inane version as being the truth ! 1. False representation :The commentators say that the Ramayana is not as true a story as the Bible. This seems to be an attempt to portray the Bible as being more trustworthy than the Ramayana. Yes, propaganda to prove Christianity’s superiority over Hinduism. This movie is part and parcel of the anti-Hindu movement and propagation of Christianity. This movie violates the religious feelings of Hindus. The Government must ban this film. 2. False representation : Ravan was a good king and the only wrong thing that he did was steal Sita. Such remarks show Ms. Palay’s anti-Hindu mentality by demeaning the Holy Scriptures of Hindus. For this she must apologise to all Hindus. 3. False representation : Ravan’s sister tells Ravan about how beautiful Sita is and says that her breasts are like big round juicy lotuses. Sita is shown wearing a cholie that reveals her breasts in one outfit from above, and in another outfit from below the blouse. Such remarks show her anti-Hindu mentality of criticizing Hindus Holy Scriptures. For this she must apologise to all Hindus. 4. False representation : The commentator says that Ravan played the veena for Lord Shiva with his intestines and He shows Ravan’s intestines tumble out of his stomach and they play the veena. Actually what is mentioned in the Ramayan is that Ravan’s devotion was such that the 72 thousand nadis or energy channels in his body created a sound (Anahat nada) and this pleased Lord Shiva. 5. False representation : Sita sings with her love for Ram in the forest. The words of her song were… ‘He is not an angel or a Saint and I know that with all his faults, he will still get by’. Then she imagines carrying Ram piggy back. After that she stands on all her fours (like a horse or a dog) and Ram is shown sitting on her back. 7. False representation : Sita is shown wearing a ridiculous amount of jewellery as the commentator says she dropped her jewellery to show the way to Lanka when she was abducted by Ravana. The commentator ridicules the Ramayan by questioning how Sita had so much jewellery when she had taken up the life of a sanyasi. Sita was only in exile. She was not a sanyasi. She dropped jewellery like her ring, anklets and earrings at strategic points on the path. 8. False representation : One commentator viciously says that one needs to ‘give her one little tight thing’ for not returning with Lord Hanuman when he came to rescue her. Another says that Sita stayed back as she wanted Lord Ram to rescue her and defeat Ravan due to the ego of wanting ‘Her husband’ to be her rescuer and so she is called a ‘bloodthirsty’ woman and is depicted with blood coming out of her mouth and blood on her hands. Sita could not allow herself to be carried by Lord Hanuman as it is a Hindu woman’s Dharma not to be touched by any man other than her husband. 9. False representation : When Hanuman reports to Ram about what he saw in Lanka, Lord Ram begins to sweat and then faints in fear. Lord Ram’s arrow never missed its target no matter where the target was. How could such a Divine warrior who was an incarnation on earth be afraid of a mere demon ? Lord Ram was fully aware of Sita’s purity. In addition, the Ramayan states that Lord Ram surrendered Sita to Agni devata and she sent an illusionary form of Sita to Lanka so that the real Sita was kept safe. After the ‘Test by Fire’ that Sita underwent successfully, Agni devta returned the real form of Sita to Lord Ram. Ask Youtube to remove this video from Youtube. Namaste. You may recall that Sita Sings the Blues was shown on PBS early last year. There were some protests but not much came out of it. While I have not personally watched the video, those who have (either in full or in part) have found it derogatory to the values that we as Hindus hold dear. Kindly send protest email a.s.a.p. as time is short. Also please circulate this to to your contacts. Subject: Protest ‘Sita sings the blues’ showing at NY’s Starlight Pavilion ! Namaste, dear supporter of Hinduism. We at the Forum for Hindu Awakening have received complaints from several Hindus about the showing of a film ‘Sita sings the blues’ at the Starlight Pavilion in New York next Thursday (21st July). We would like to bring to your attention that ‘Sita sings the blues’ denigrates Hindus’ revered scripture Ramayan, and Deities Rama and Sita. People from different faiths live in America and it is important to maintain sensitivity towards each other’s religion, to live harmoniously. Denigration of religious symbols and icons causes disharmony, as it hurts the sentiments of the community being targetted. Hence, we have sent the below request to Rohan Narine, who has organized this event. At the same time, we urge Starlight Pavilion to cancel the booking for this event, as a show of goodwill to the Hindu community in New York. We hope that you will show sensitivity towards the religious sentiments of their Hindu patrons. We hope to receive a positive response from Starlight Pavilion by Sunday. Otherwise, we would be forced to intensify our protests, by calling for a boycott of Starlight Pavilion, as well as organizing a protest demonstration in front of Starlight Pavilion. We have received complaints from several Hindus about your showing the film ‘Sita sings the blues’ at the Starlight Pavilion in New York next Thursday (21st July). We would like to bring to your attention that ‘Sita sings the blues’, which its producers claim to be based on Sage Valmiki’s Ramayan, is actually a denigrating parody of the Ramayan ! Through this animation film, animator Nina Paley has drawn irreverent parallels between her own heartbreak and the divine story of Mother Sita, who has been worshipped for ages by Hindus as the symbol of purity and devotion. What is your purpose of showing this film, when it has been so controversial for the insensitivity shown to Hindu sentiment ? Shall we say that you too, are supporting this denigration ? We urge you to cancel showing the film ‘Sita sings the blues’ at the Starlight Pavilion. We hope to receive your positive response by Sunday, after which, we will be forced to intensify our protests, by making it public, and calling for a boycott of Starlight Pavilion, as well as your future endeavors. July 13 was the 24th birthday of Ajmal Kasab who has been given death sentence by a Mumbai Court for the massacre and mayhem in Mumbai on November 26, 2008. Congress, ever mindful of Muslim votes cannot even think about hanging him, national pride,security and sanctity of the Supreme Court be damned. Congress, under Sonia Gandhi cannot even think of hanging Afzal Guru, convicted for his part in the parliament Bombing in December 2001. In 2004, the Supreme Court ordered that Afzal Guru be hanged. The execution was to be carried out on October 20, 2006. Almost five years later, Afzal is very much alive costing the tax payers a pretty penny, thanks to Sonia Gandhi who rules her party and the nation with an iron fist hidden in a velvet glove. So far the Government of Bharat has spent 310 million Rupees to keep Kasab alive. So, to thank the Congress led government, Ajmal Kasab’s handlers decided to give a memorable gift to people of Bharat. Yesterday, on July 13, they offered bomb blasts during rush hour in three crowded locations in Mumbai. 21 are dead and 141 are injured; some more may succumb to their injuries. These numbers that we hear have become routine and do not mean a thing unless one of them is your father/mother/brother/sister/husband/wife/uncle/cousin/friend. Numbers do not matter unless it is your leg or hand that has been blown to bits or it is your eye that is pierced by sharpnels. These numbers have no meaning unless it is your loved one whose body is set on fire by the blast. The politicians who are principally responsible for this day because of their spaghetti spines when it comes to taking action against any Muslim, will mouth stupid inanities. Prime Minister Manmohan Singh a.k.a. captain sleeping at the wheel while the country is plundered and looted by his coalition Dharma partners, President Pratibha Patil, ever indebted to Sonia Gandhi for putting her in a place where no one can touch her for all the cooperative bank scams she was involved in- in Maharashtra, Sonia Gandhi, the Vishkanya, i.e., kiss of death for mother Bharat, Prithviraj Chavan, Chief Minister of Maharashtra, virtually a nincompoop dancing to His Master’s Voice from 10 Janpath, the home Minister, P.C. Chidambaram, who is too busy to find ways to stay out of Tihar jail with the noose getting closer by the day in 2G scam, all these characters have come out with statements condemning the blasts and at the same time advising the hapless people to stay calm. You know what? They are good at making these utterly useless statements because they have had repeated practice of making them in last few years. Friends, their words mean nothing, They do not give a hoot whether 21 or 2100 die in these blasts so long as their ill gotten billions are safe in Switzerland. Solution? Let there be no more birthdays for Kasab. Create a nationwide pressure, such a pressure that the government would be either forced to hang Kasab and Afzal or would be shown the door. Let us vow to give Kasab gift of hangman’s noose on his next birthday, July 13, 2012. Can it be done? Yes. If Egypt can do it, Algeria can do it, Yemen can do it, Libya and Syria are about to do it, why can’t we? History favors those, who seize the initiative. Let us not wait for another blast. IANSJuly 13, 2011: At least 21 people are killed and more than 140 injured in three bomb blasts in Mumbai. Dec 7, 2010: A bomb explodes on the banks of Ganga in Varanasi, Uttar Pradesh during evening prayers, killing a a girl and injuring 20 people, including some foreigners. Oct 14, 2010: At least five people injured in a minor bomb explosion in Kanpur city of Uttar Pradesh. Feb 13, 2010: A blast in German Bakery in Pune city of Maharashtra kills nine people and injures 45. April 6, 2009: A car bomb blast in Guwahati kills six people and injures 32. Nov 26-29, 2008: Terror attack in Mumbai kills 166 Indians and foreigners. October 30, 2008: Terror attack in Guwahati kills 61 and injures 300. Sep 29, 2008: Blast in Malegaon in Maharashtra kills eight people and injures 80. Sep 13, 2008: Serial blasts in Delhi kill 30 people and injure more than 100. July 26, 2008: Serial blasts in Ahmedabad kill 40 people and injure more than 50. July 25, 2008: Nine explosions in Bangalore kill one and injuring 12. May 13, 2008: Eight serial blasts rock Jaipur in a span of 12 minutes leaving 65 dead and over 150 injured. Oct 11, 2007: Bomb blast inside Ajmer Sharif shrine during Ramadan kills three and injures 28. Aug 25, 2007: 32 dead, 60 hurt in Hyderabad terror blast. May 18, 2007: A bomb at Mecca mosque in Hyderabad kills 14 people. Feb 19, 2007: Two bombs explode aboard a train from India to Pakistan, charring at least 66 passengers, most of them Pakistanis, to death. Sep 8, 2006: 30 dead and 100 hurt in twin blasts at a mosque in Malegaon in Maharashtra. July 11, 2006: Seven bombs explode on Mumbai’s trains killing over 200 and injuring more than 200. Casey Anthony is expected to get out of jail this weekend. If so, the news will once again energize the cult of Casey. These are the people whose prime source of entertainment for the past three years has been the death of a 2-year-old girl. Caylee’s death did wonders for Nancy Grace‘s ratings. But it’s the legions of Americans who provide those ratings I find most troubling. They voraciously consume everything about the case. They busy themselves writing missives on Facebook. Some even took their summer vacation at the Orange County Courthouse. Just imagine if America had channeled its energy into something productive … something more than trage-tainment. Three years ago, when this case first started, I suggested readers do just that — that they volunteer, for example, with one of the many nonprofits that helps toddlers whoaren’t dead. I suggested if they want to yell and scream, they should do so on behalf of the millions of neglected children who lack a voice. Prosecutor Jeff Ashton suggested the same thing last week when he saw the rage building after the verdict. I wonder how many will. Making a difference, after all, takes more work. And while it can be fulfilling, it’s usually less titillating. You may remember that interest in the Anthony case took off after the media got hold of pictures showing Casey drunk, dancing in a tight dress and partying with her cleavage exposed. The public ate it up. By the time the case went to trial, the American media was all Casey all the time. That most certainly included my newspaper, which set records with the millions of new visitors at OrlandoSentinel.com during the trial. One can only imagine what would happen if the same kind of media resources and manpower were ever focused on all the problems and crises affecting the children who are still alive. We live in a state infamous for short-changing children. We have one of the highest child-abuse rates in the country. We have more uninsured children than 48 other states. Our graduation rates lag. But stories about such things don’t make ratings spike. Because you don’t watch them. Sure, I know the Anthony case was compelling. I get that. But so is the plight of so many children living in our own backyard — kids who have been beaten by their parents, left to rummage for food from trash cans and found living in sheds. We’ve written stories about all of those things. How many of those did you share with all your Facebook friends? Want to redirect some of your Casey energy? •If children are your concern, think about helping one of the many great nonprofits that protect and even shelter at-risk children. There are dozens, ranging from Harbor House of Central Florida (harborhousefl.com) to the Children’s Home Society of Florida (chsfl.org). The last time I visited the Children’s Home Society’s crisis nursery, I saw a 2-year-old whose father had broken her leg, and a neglected brother and sister who arrived wearing the only clothes they possessed. •If seeing “justice served” was supposedly your main interest in the case, you can actually make a difference on that front as well. Locally, you can follow CourtWatch (courtwatchflorida.org), which keeps tabs on cases of child abuse, domestic violence, sexual assaults and more. Dedicated advocates like director Laura Williams watch out for repeat and violent offenders seeking leniency from the courts. •And if you’re all about expressing outrage to politicians, save your energy on the Casey case. These guys are already elbowing one another to get in front of cameras to tout “Caylee’s law.” Instead, ask your elected officials to do more for the kids who are still with us. Every child should be protected from violence, have access to health care and receive a good education. In an ideal world, all parents would ensure that. Our world is far from ideal. I have to warn you: There’s no cleavage involved in any of the activities above. Nancy Grace won’t be screaming about them on TV. But you will make a difference.